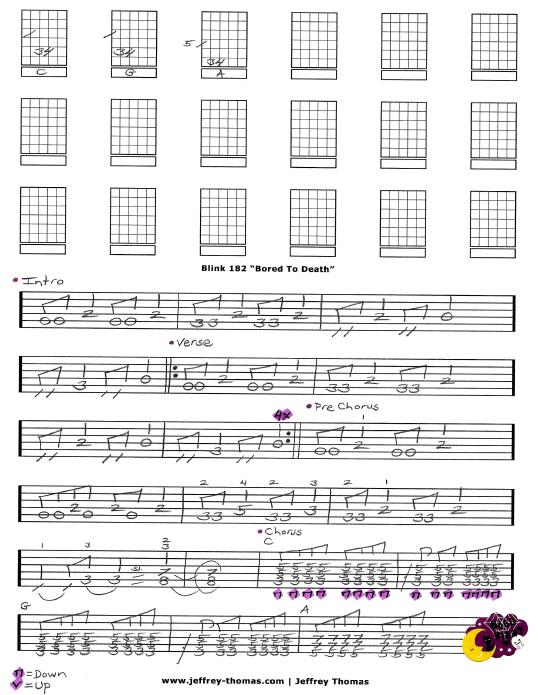 Blink 182 Bored To Death Free Guitar Tab by Jeffrey Thomas. Learn to play this cool Blink 182 song with my free guitar tab. I have the proper song structure, chords and fills following the studio version. Many of my guitar students enjoy learning Blink 182 songs. Want the full guitar tab for free? Just send in your email address using the form provided. Looking for the best online guitar lessons? Fill out the Schedule A Free Lesson form to set up your free Skype guitar lesson today! “Bored To Death” is guitarist/vocalist Matt Skiba’s first single with the band, and the first single to not feature original guitarist and vocalist. Find more cool free guitar tabs on my blog, tab and video pages.